The story of the invention of the airplane is a Puritan fairy tale. It is the story of how two honest, straightforward, hard-working Americans accomplished something fantastic and magical -- creating a craft of stick and fabric that mounted the air like the chariots of the gods, opening the skies to all humankind. Their success came so suddenly and from such an unexpected quarter that their contemporaries could not believe the Wrights had done what they claimed. After all, if prominent scientists and engineers the world over had been confounded in their efforts to invent the airplane, how could two common men from rustic America have succeeded? Like many fairy tales, the story also has a dark and unhappy ending. Around the turn of the century, dozens of people were working to invent the airplane. The period of active experimentation begins in 1891, when noted German engineer Otto Lilienthal began experimenting with hang gliders. Lilienthal took seriously the ideas advocated by Sir George Cayley almost a hundred years earlier. Through an extensive study of birds and bird flight, Cayley realized that the lift function and the thrust function of bird wings were separate and distinct, and could be imitated by different systems on a fixed-wing craft. Lilienthal began his work on heavier-than-air craft not by developing a complete airplane, but instead by focusing his efforts on a fixed-wing glider. Lilienthal brought a much-needed respectability to the enterprise of inventing an airplane. Up to that point, efforts to invent airplanes were considered to be the province of crackpots and wild-eyed dreamers. But when a hard-headed German engineer entered the game, other respectable people were soon to follow. In addition to the respectability he brought to the field, Lilienthal made two more important contributions to the nascent field of airplane invention: the style of perfecting a glider before attempting powered flight (which Gibbs-Smith refers to as the 'airman' approach), and a table of the lift provided by curved wings. Lilienthal was killed in a gliding accident August 10, 1896. Following in Lilienthal's footsteps, efforts to invent an airplane became commonplace in the 1890's. The majority of the efforts were in Europe, including Captain F. Ferber, Henri Robart, Solirene, Levavasseur, Clement Ader, Percy Pilcher, and Sir Hiram Maxim. In the U.S., prominent attempts were made by Octave Chanute and Samuel Pierpont Langley. The blue points in Figure 1 depict the progress made during the period 1894 to 1905. Although an occasional craft flew farther than 100 meters (about the length of a football field), this level of performance was exceptional. Unfortunately, inventors at the time were unable to capitalize on their success. Often times a new generation craft did not perform as well as its predecessor. Thus, the blue regression line in Figure 1 is essentially flat. This tendency is usually true for individual inventors as well as the field as a whole. Against this backdrop, we see the Wright brothers efforts to develop an airplane, plotted in green on Figure 1. The Wrights first craft in 1900 was approximately equal to the best that had been done prior to that time. They made steady progress in 1901 and 1902. The 1902 glider was the first truly effective heavier-than-air craft. In 1903 the Wrights created their first powered craft, which successfully flew on December 17, 1903. More capable airplanes were developed in 1904 and 1905, which culminated in their stunning European and American flights in 1908. Here it is apparent there is a real mystery in the invention of the airplane: How did the Wrights begin at the top of the field and make sustained progress when their contemporaries could not? Unlike mystery novels, there is no simple answer to the mystery, but the answer is fascinating and instructive nonetheless. *Figure 1 above depicts the longest flights made by various aircraft in the period 1890 to 1909. Green points represent the various Wright craft during this period. Blue points represent non-Wright craft made between 1890 and 1905, while red points represent non-Wright craft made from 1906 to 1909. Lines on the graph are regression functions. The flat blue line indicates that the field as a whole was making NO sustained progress through the end of 1905. This lack of progress is almost invariably true of individual inventors as well as the group as a whole. 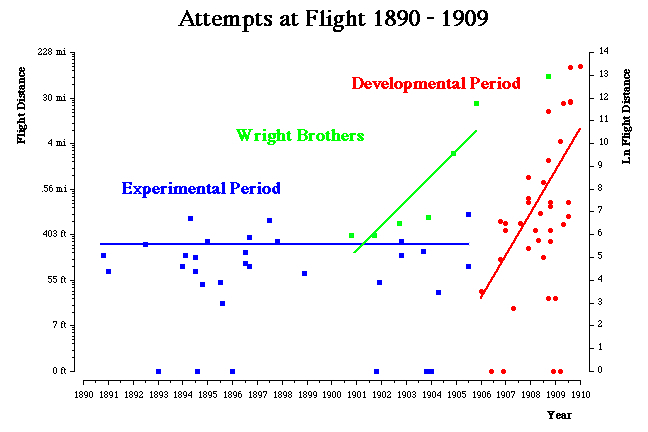 The positive slope of the Wright brothers indicates a steady progression in the ability of their heavier-than-air craft. Once details of the Wrights methods became public when their patent was issued in late 1905, other inventors quickly copied the important discoveries of the Wright brothers, and developed airplanes as capable as those of the Wrights. Resources for the development and support this site have been contributed by the Beckman Institute, the Institute of Aviation, and the Department of Psychology at the University of Illinois. Naturally, they are not responsible for any errors or mistakes contained herein. The views expressed herein are my own, and do not necessarily reflect those of my employers. This document is public domain and may be copied freely and used without restrictions. The same is true for all included photographs.